A golf fan had a really bad experience at the Ryder Cup a few days ago. 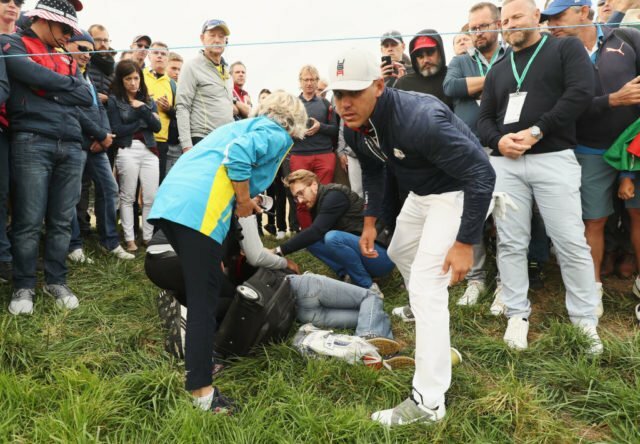 49-year-old Corine Remande was watching the USA vs. Europe event on Friday morning at the Le Golf National club in Saint-Quentin-en-Yvelines (near Paris) … when Koepka’s 6th hole tee shot hooked left and smacked her in the face. You can see a photo of help arriving below. Yeah, that’s a pretty rough day out. I don’t think anybody ever goes to the course expecting to come back with only one eye. That’s about as bad as it gets. I’m honestly not sure it could get any worse. Imagine you’re just chilling one second, and then the next moment, your eye gets blown up. Life comes at you really fast sometimes. Listen, I’m not trying to make a joke here, but this is just an absurd situation. I feel like there’s a better chance of winning the lottery than losing an eye at a golf event. I’ve played a lot of golf in my day. Wasn’t any good, but the only thing we ever managed to lose were a few balls and beer cans all the way. Perhaps we also left a little dignity out on the course. But we always came home with all our eyes. Prayers out to Remande, because this situation is just awful.